Source: Fusion Seal Corporation/Protec Industries, Inc.
Line-It is PE 3408 HDPE pipe manufactured with a helical, spiral, closed cell profile wall that has a pipe stiffness per ASTM D2412 of either +46 psi or an optional +32 psi. 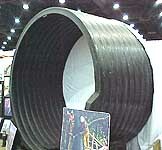 This high pipe stiffness helps reduce load induced, potential pipe deformation. It is supplied with an Electro-Fusion joint that, according to the manufacturer, is watertight and as strong as the pipe itself. The patented joint incorporated into the pipe ends, when completed, has a smooth inner and outer wall with no projections, substantially flush with the pipe OD & ID. This makes it easy to install as a liner. It has no coupling restrictions, while maintaining high flows. While this is a well-suited product for use as a liner for deteriorated culverts and pipelines, it is also a tough, chemically resistant pipe, suitable for direct burial in severe use situations. Applications include industrial and chemical effluent pipe, sewer or storm sewer pipe, out-fall piping, and literally any low pressure or gravity piping application requiring a premium grade HDPE pipe. Fusion Seal Corporation/Protec Industries, Inc., 3562 Market St., St. Louis, MT 63103. Tel: 314-533-3030; Fax: 314-533-3003. Fusion Seal Corporation/Protec Industries, Inc.